Image courtesy of "Dangit... my knees are killing me but that kid behind me has all the legroom in the world. Unfair, I tell ya. Unfair." Have you ever been squeezed into an airplane seat and then looked behind you to see you’re in front of a small child who has plenty of legroom? In a car, you’d be able to slide your seat back a few inches to give you some extra space, but without cramping the kid behind you. A new patent aims to put that same idea into practice on commercial aircraft. Of course, it’s not as simple as just having seats that can slide back and forth. Otherwise, we’d all just be slamming our seats all the way back in a futile, greedy attempt to maximize legroom. And if the seats in any given row were no longer aligned, that would be a safety concern, as it could make it more difficult for middle- and window-seat passengers to exit into the aisle. 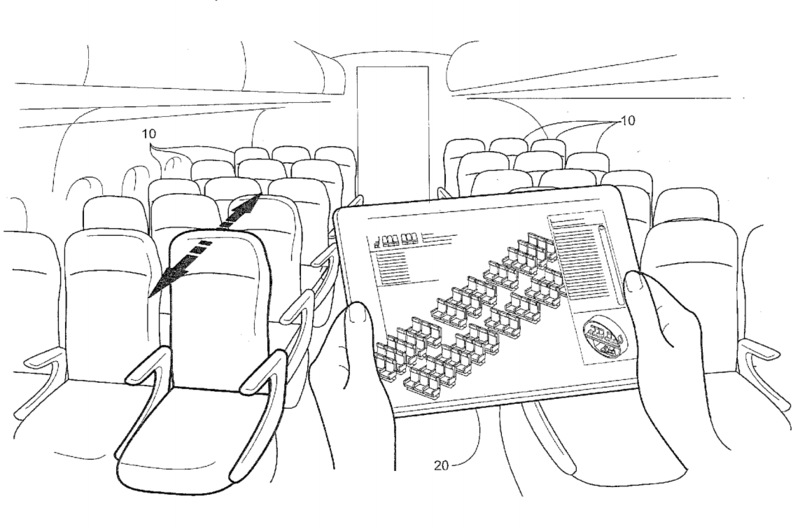 That’s why this patent from Florida-based B/E Aerospace doesn’t just imagine a system for adjustable seats, but discusses the need for a sensible way of managing the seating arrangements. According tot he patent, passengers’ respective heights are measured at check-in. “Once most passengers are checked-in, the seating on the aircraft may be adjusted to better accommodate tall and short passengers,” explain the inventors, who give the example of putting those who fit into the top 5% of height for the average male get seated behind a row of people who are, at most, only 30% that of the average adult female. The seats for the small, presumably child, passengers would be moved up to accommodate the legroom for the taller travelers behind them. 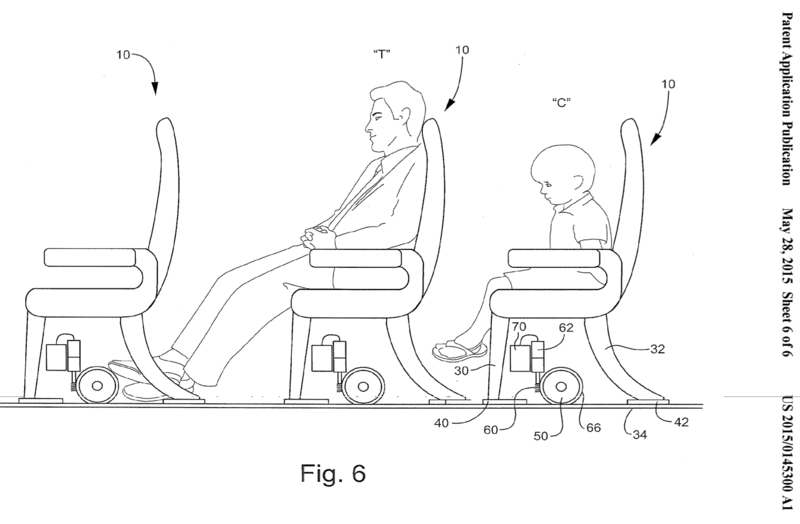 “Even a relatively small incremental increase in seat spacing for the tall passengers can provide additional comfort with no loss of comfort to the much smaller passengers seated in front of the tall passengers,” reads the patent. While the adult looks pleased as punch, can someone get that kid a lollipop? He looks miserable, even though his legroom is still ample. And rather than a labor-intensive system of manually operated anchors and latches, B/E Aerospace proposes a system that could be operated via a tablet (or similar device) by the cabin crew. “An attendant walking through the aircraft with the tablet can initiate the adjustment as well as verify or make corrections to the adjustments,” the company explains. While this concept allows carriers to keep the same number of seats in their cabins, we’re having a hard time imagining the tech being used for more than a few rows. 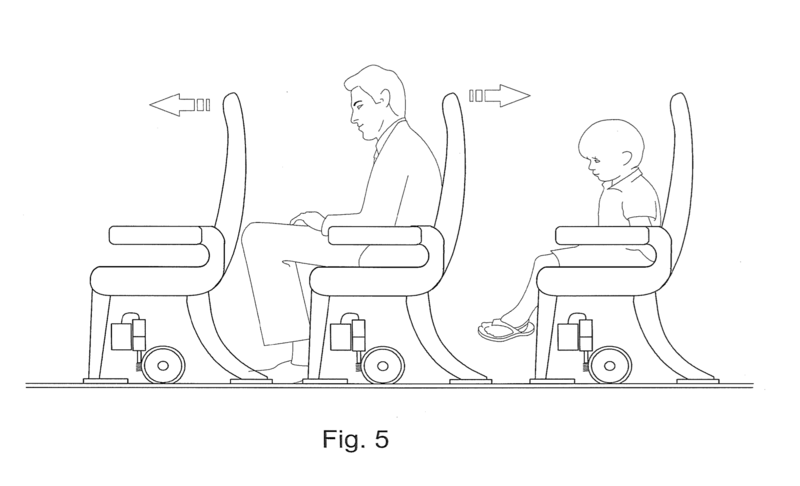 In the above example, it presumes not only that there are enough small children on a plane to fill rows of their own, but also that these kids’ parents would be okay with being seated separately from them because of their height. A more likely use for this sort of system would be for an airline that sells premium seating and wants to be able to adjust the number of extra-legroom seats it has available. For example, a plane going from NYC to L.A. would probably have plenty of passengers willing to pay extra to spare their knees during a 6-hour flight, but when that plane leaves L.A. and makes the shorter trip to Las Vegas, it might have trouble selling all those premium seats. It’s certainly an interesting idea and one that will probably show up in some form in the years to come. can we get more awkward?